Time to Consider Product Recall Insurance? The decision by Texas-based Blue Bell Creameries to recall all of its products after two samples of its ice cream tested positive for listeria is a timely reminder of the importance of product recall insurance. Product recalls can be costly and logistically complex. In Blue Bell Creameries’ case the expanded voluntary recall announced Monday night includes ice cream, frozen yogurt, sherbet and frozen snacks distributed in 23 states and international locations. The company had issued an earlier more limited recall last month after the U.S. Centers for Disease Control and Prevention (CDC) linked ice cream contaminated with listeria to three deaths in Kansas. As of April 21, 2015, the CDC says a total of 10 people with listeriosis related to this outbreak have been confirmed from four states. A 2014 report by Aon notes that the number of product recalls in the United States and Canada for both food products and nonfood products continues to grow year over year. Each year, hundreds of products are recalled in the U.S. Some historically significant recall events have included such well-known brands as Tylenol, Perrier, Firestone Tires, Pepsi and Coca-Cola. The Insurance Information Institute (I.I.I.) reminds us that product recalls can be financially devastating and potentially put a company out of business. No organization is immune to the risk of a product recall–even those with the best safety records, operational controls and manufacturing oversight. In a post in the Wall Street Journal’s Morning Risk Report, crisis management experts note that how well a company succeeds at regaining customer trust following a product recall will likely determine whether it recovers from the negative hit to its reputation and bottom line. True. Insurance can also help defray the financial hit on a company. Product recall insurance helps cover a wide range of costs including advertising and promotional expenses to launch a recall, as well as the costs related to product destruction and disposal, business interruption and repairing a damaged reputation, the I.I.I. says. Another coverage worth considering is product contamination insurance, which protects a company’s bottom line in the event its product is accidentally or maliciously contaminated. Once again food safety is in the news. This time itÃ¢â‚¬â„¢s cantaloupe. The current outbreak of listeria infection linked to cantaloupes grown at Jensen Farms in Colorado, so far has caused at least 13 deaths and left 72 people ill. According to reports, this makes it the deadliest foodborne outbreak in the United States in more than a decade. AndÃ‚ the number of illnesses and deaths are expected to rise, officials say. It comes just months after a deadly E. coli outbreak in Europe. The Food and Drug Administration (FDA) earlier issued a press release announcing that Jensen Farms issued a voluntary recall of its Rocky Ford-brand cantaloupes after being linked to a multi-state outbreak of listeriosis. According to Centers for Disease Control and Prevention (CDC) estimates, each year roughly one in six Americans (or 48 million people) gets sick, 128,000 are hospitalized, and 3,000 die of foodborne diseases. CDC also notes that some 3 or 4 outbreaks of listeria-associated foodborne illness are diagnosed each year in the U.S. The foods that typically cause these outbreaks have been deli meats, hot dogs, and Mexican-style soft cheeses made with unpasteurized milk. Produce is not often identified as a source, but sprouts caused an outbreak in 2009 and celery caused an outbreak in 2010. 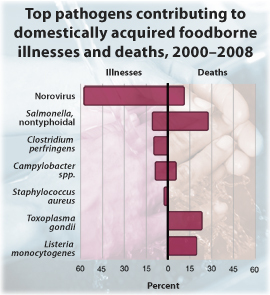 Listeria, along with other pathogens such as salmonella, toxoplasma, and norovirus are the leading cause of foodborne deaths, according to CDC statistics (see chart via CDC website below). Meanwhile, check out this Q+AÃ‚ at Businessweek about listeria in fruit. A report from Aon last year noted that the increasing frequency and severity of food contamination incidents is prompting greater awareness among food system, agribusiness and beverage companies to insure against such events. Food recalls and product recalls in general can be an expensive business. Just yesterday Abbott Laboratories announced that it will take a one-time charge in the third quarter 2010 for expenses related to its voluntary recall of five million cans of certain Similac powdered infant formula due to possible contamination by beetles. The Food and Drug Administration (FDA) has determined that while the formula containing these beetles poses no immediate health risk, infants who drink it could experience symptoms of gastrointestinal discomfort that could cause them to refuse to eat. A Wall Street Journal article has more on this story. The latest contamination event underscores the point that whether itÃ¢â‚¬â„¢s eggs, toys, cars, peanut butter or pet food, product recall as a precautionary step or worse following actual injury or damage can be costly to a business and its reputation. A just-released Aon study notes that the claims costs connected to the recent half billion egg recall will be unprecedented and include liabilities such as business interruption and reputation damage. Aon also reports that the increasing frequency and severity of food recalls is prompting greater awareness among food system, agribusiness and beverage companies to insure against such events. But itÃ¢â‚¬â„¢s not all about insurance. Pre-incident planning: every company should have a well-documented and practiced product recall or retrieval plan, with a clear chain of command and communication. No amount of insurance can replace customer confidence lost due to poor planning and/or execution of a crisis or recall. Crisis management planning: an appropriate crisis program goes beyond the pre-incident plan to coordinate all activities associated with a crisis. Team members may include the CEO, general counsel, risk manager and other company reps.
A recent paper by Lockton Companies has more on the innovative coverages developed by insurers to respond to product recall and contamination events. As auto manufacturer Toyota begins a publicity offensive in response to two separate but related recalls of around nine million autos worldwide, a couple of reports make the important point that the long-term damage to the companyÃ¢â‚¬â„¢s reputation could be much more costly than the immediate financial fallout. The recalls and sales stoppages announced by Toyota come after floor mat or accelerator pedal problems in a number of its vehicles and several crashes. An article in the Wall Street Journal observes that if ToyotaÃ¢â‚¬â„¢s problems escalate, it could cause irreparable damage to its brand identity, requiring the company to spend billions of dollars in advertising, sales incentives, legal bills and, possibly, interest payments. Meanwhile, an article in Business Insurance cites various analysts saying that the damage to ToyotaÃ¢â‚¬â„¢s reputation for quality and safety could be extremely costly. What action a business should take to limit this damage and the topic of recall insurance are also discussed. ThereÃ¢â‚¬â„¢s no doubt that product recall as a precautionary step or following actual injury or damage can be costly to a business and its reputation. As we’veÃ‚ said before, just one example is the 1990 worldwide recall by Perrier when traces of benzene found in the water eventually led to the recall of 160 million bottles of Perrier. There have been other notable examples, but the bottom line is that product safety in any business is paramount.